Installing an energy-efficient electric tankless water heater provides you with unlimited hot water, lower electric bills, and it may even help improve the resale value of your home. Tankless, or demand-type, water heaters deliver hot water in a more efficient way than a conventional tank-style water heater. Instead of holding water in a tank, they heat the water when it’s needed, wherever it’s needed. There is a constant supply of hot water to showers, faucets and hot water appliances like dishwashers and washing machines. Shopping for a new water heater that will accommodate your needs, fits in your budget and is easy to install is a daunting task. Don’t worry though, we’ve been researching the best tankless electric water heaters for you. We’ve taken a look at the most important details, such as the unit’s delivery capacity, power requirements, overall size, features and controls, and ease of installation. We didn’t stop there, however, we also hunted down negative aspects of each, so you can make a truly educated decision about which unit is the best electric tankless water heater for you. While this point-of-use electric water heater isn’t tankless, it is still one of the best options available. Equipped with a 7-gallon capacity mini-tank, it easily provides hot water to a sink, or appliance when it’s needed most. It is so compact that it can be used an RV, boat, or outdoor kitchen. The best part is its low price tag of less than $200, making it a fairly inexpensive home improvement project. Instant hot water, where and when it’s needed make this a customer favorite. It can be installed just about anywhere, even under the sink since it’s only 17.5″ x 14.5″ x 17.5″. It was designed to blend into the room, rather than stand out, so it can even be wall-mounted. Not only is it compact, but it can also be mounted either vertically, or horizontally. The tank is glass-lined, meaning it’s well insulated, providing 94% thermal efficiency. The temperature of the water is easily controlled with the turn of a dial. Temperature ranges from 65°F-145°F, so it’s comfortable to use, no matter what. There’s also a built in temperature and pressure relief valve to ensure your safety. This is not going to provide continuous hot water for very long due to the small tank size. It’s probably not going to provide enough hot water for most people to get a hot enough shower to be satisfied. That said, it’s best used in a bathroom sink or as an assist to another water heater to provide hotter water. In high demand situations, hot water availability will be limited. This unit has to be hard-wired into the house’s electrical system, which can prove challenging for inexperienced handymen. You also nearly two gallons of the storage capacity of the tank when it’s mounted horizontally. While that may not seem to be a big deal, it can certainly pose problems when you need more than five gallons of hot water at a time. This is a nice little point-of-use electric water heater for most household applications. It’s a fairly straightforward installation process, and doesn’t require much space. If your current water heater isn’t keeping up with the demand, this is a great way to give it a boost. It also comes with a 6 year warranty on the unit and a 2 year warranty on parts, which is excellent for a unit in this price range. This is an ideal choice for medium size households (3 to five people) living in the northern United States, and anyone with a high demand for hot water for showers, sinks and appliances such as a dishwasher and washing machine. With a price of less than $500 when self-installed, the ECO 27 is a budget-friendly option for homeowner’s with DIY plumbing and electrical experience. It heats 3 gallons of water per minute (GPM), even when the temperature of the input water is as low as 37°F. So, you can run two showers at once, two sinks and shower, or the dishwasher and sink together. It will output up to 6 GPM in warmer climates where the inlet water temperature is higher. At that rate, four showers and all of your faucets would have hot water without any problem. Installing the ECO 27 results in up to 50% reduction of water heating costs over a conventional tank water heater, according to reviewers. It has a modulating control system that automatically adjusts the power usage and water pressure settings for a consistent output of hot water. The water’s temperature is adjustable in 1° increments ranging from 80°F – 140°F using the digital temperature control panel. It’s space conscious, measuring just 17″ H x 17″ W x 3.625″ D. Plus it has a stylish, modern design that’s actually pleasant to look at no matter where it is in the house. The internal components are constructed of copper and stainless steel for maximum efficiency, long life and easy replacement. And, it comes with a lifetime warranty so you can rest assured it will last for years to come. Most people find that the ECO 27 provides plenty of hot water but, not always. It doesn’t always provide simultaneous hot water for showering, sink use and appliances, according to reviewers. In most cases, it’s because the input temperature of the water falls to 37°F for long periods. The unit simply doesn’t have time to heat the water properly. Another issue is the electric requirements. To work safely, it needs 200 Amp service to the home and three 40 Amp double pole breakers available. Homeowners with no electrical training or experience find the process difficult and often call in a professional electrician to do the job, which basically doubles their investment. German engineering and technology come together in this tankless water heater. It’s designed to replace a conventional water heater tank without disrupting the entire household’s hot water. For large families with two or three bathrooms, and a high demand for hot water, it’s one of the most popular choices on the market. It’s priced around $700 without installation, making it affordable for most. This unit produces 2.7 gallons of water per minute (GPM), and automatically adjusts to meet demand. At input water temperatures as low as 42°F, it provides hot water for one shower and a sink running at the same time. At higher inlet temperatures, it can heat up to 5 GPM, or two showers and a sink. Water temperature can be set from 86°F – 140°F and capped at 109°F to prevent scalding. 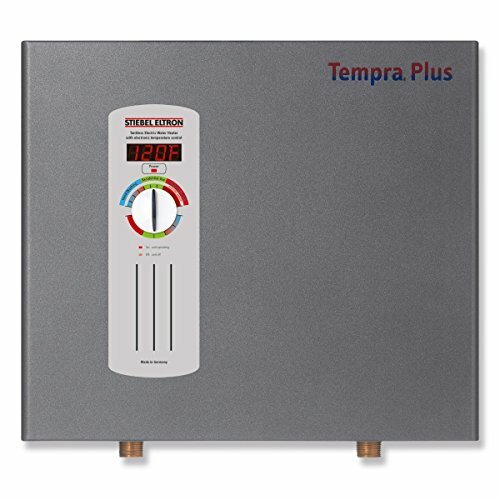 Compared to a conventional tanked water heater, this tankless unit will use 15–20% less energy to heat water. What’s more, it’s 99% efficient, meaning it’s not wasting energy, but rather conserving it. For some homeowners, the energy savings are even higher each month. This is done by optimizing the hot water use and installing low-flow shower heads and sink aerators, conserving water and energy. Size matters, and in the case of a water heater, smaller is better. This unit fits the bill at only 21.7″ x 20.1″ x 9.6″, so it can be installed close to the point of delivery, rather than taking up a huge footprint in the basement. Not only is is compact and discreet, it’s also completely silent when it’s working. Reviewers note that installation can be difficult for a homeowner to do. If the home lacks the required 150 AMP electric service, an upgrade is necessary, along with the installation of two 60 AMP double pole circuit breakers. This must be done by a licensed electrician. Professional fees can easily exceed the initial cost of the unit, as high as $1,00 for installation and $3.500 for electric service upgrades. Users say that it doesn’t always provide whole house hot water. In colder climates or if demand is high there is a drop in water temperature and pressure. This is due to the internal controls that limit water output when demand increases, restricting the flow to each faucet. Others say it takes between 20 to 90 seconds for hot water to reach the faucet or shower, even when the unit is fairly close by. This is a good choice for larger households in warm climates, as it will provide adequate hot water without interruption. When water inlet temperatures are very low, however, the unit may struggle to keep up with multiple uses. Without installation fees, it’s one of the most affordable, and efficient tankless water heaters available, and comes with a 7 year warranty against leakage and 3 years parts replacement. 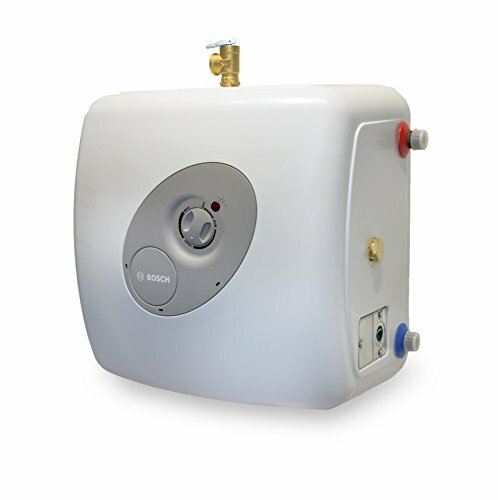 Like the 24 KW model we mentioned earlier, this tankless water heater is engineered to last for years. It is an excellent choice for large families that require multiple showers a day, as well as laundry and dish washing activities. It’s best suited for bigger homes, as it would be overkill for a small house with very limited demand, or only a single shower. 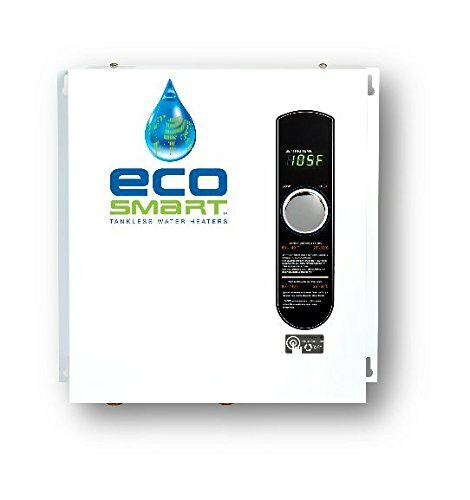 We consider it as the best electric tankless water heater. This unit consistently provides 3.7 gallons of water hot water per minute (GPM) where input water temperatures drop to 42°F. That is plenty of hot water for two showers and a sink to run at once. It performs even better with inlet temperatures of 72°F, producing up to 7.5 GPM, that amounts to four hot showers and a sink running. Output ranges from 86°F-140°F, depending on the user’s preference. This unit, like the smaller version, operates at 99% efficiency, so there is no energy wasted. The average homeowner will see a 15–20% drop in energy use to heat water. That can easily translate into $30 or more in savings each month. Even more savings are realized when low-flow shower heads and sink aerators are installed throughout the home. You won’t need a lot of space for this unit as it is only 14.52″ x 16.54″ x 4.61″ and it’s wall mounted. That means you’ll have more room in your basement, pantry, or wherever it’s installed. It works so quietly that you won’t hear it working, even when it’s under a heavy load. This unit requires 300 AMP electric service and two 50 AMP double pole breakers, which means it may be necessary to upgrade the home’s service. While homeowners with electrical experience sometimes do the work, it should be done by a professional. Of course, calling in an electrician will bump the price up substantially, however, working with that kind of power can be dangerous, so it is a good idea. In some cases, when the input water is hard, buildup is known to occur within the unit, causing it to clog up and quit working. While the warranty generally covers these issues, it’s wise to be proactive. To overcome hard water problems, install a water filter to remove minerals and other contaminants before it reaches the water heater. The vast majority of reviewers are very happy with the performance, and energy efficiency of this unit. It produces adequate hot water for large homes, even when the input temperature of the water is very low. It’s backed by a 7 year warranty against leakage as well as 3 years for parts replacement, so the company really does stand by their product. 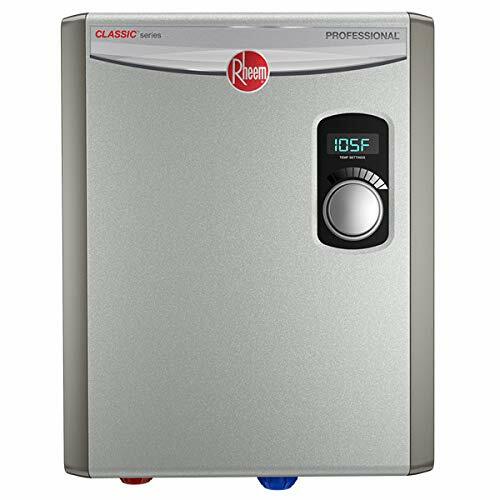 This is a great point-of-use tankless electric water heater, but it also provides continuous hot water for multiple applications simultaneously. It’s best suited for medium-size households that don’t have a huge demand, yet want instant hot water for showers, sinks and appliances. The price is comparable to other units on this list at around $450 with a do-it-yourself installation. According to reviewers, this is an extremely simple unit to install, even for an amateur handyman. You won’t have to make room for this little water heater because it’s so compact. In fact, the entire unit is only 4″ x 15″ x 19″, that’s small enough to fit into even the smallest spaces. Its stylish good looks mean that it won’t clash with your interior design either. With digital temperature controls, you can set your ideal water temperature in increments of 1°F ranging from 80°F to 140°F. Not only that, but it is 99.8% energy efficient, meaning it will help keep those high electric bills in check. It produces up to 4.4 GPM, depending upon the temperature of the inlet water, which should provide enough for a couple of hot showers and some dishwashing. Some customers have reported that they experience flickering of their dimmable LED light bulbs when the heater engages. The problem is easily resolved by installing incandescent bulbs, however, the draw on the electric power may cause issues with other appliances. If you’re operating on less than 200 AMP household service, you may need to upgrade in order to provide the unit with adequate power. While not the most common complaint, some customers have noted that the installation diagrams are printed upside down. For someone who has no experience, this can pose quite a problem. Users have noted that they have had to call in an electrician and call the company’s technical support line to overcome this issue. All things considered, this is an excellent electric tankless water heater for most households with average hot water needs. Whether installed as a point-of-use unit, or a whole house water heater, it provides a continuous supply of hot water and it’s nearly 100%energy efficient. What’s more, it is covered by Rheem’s warranty, so if you have problems, it will be repaired or replaced.